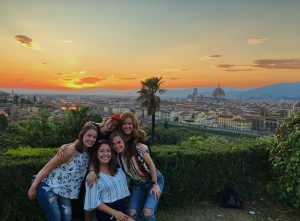 SAI caught up with student Ambassador Sara, who answered a Q&A about her time in Florence. My favorite memory is from the day I spent with my friends in Positano. We were so exhausted from a long bus ride and slept for only two hours. But, once we got going the next day, we had the most relaxing time on the black sand beaches. We all got a variety of seafood dishes and feasted after we tried, and failed, to take Instagram worthy pictures in the water. It was such a fun day that we ended it with limone gelato that was absolutely delicious. 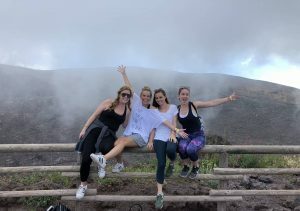 I got to check hiking Mount Vesuvius off my bucket list! 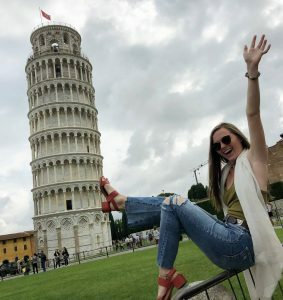 Getting that touristy picture in Pisa is a lot more work that you think! My study abroad experience proved to me that I was capable of living in another country for an extended amount of time on my own. It helped me to grow as a person in a way that I was able to plan my weeks and travels better, and it taught me how to adapt when I thought I was lost or if I was worried about learning to use the trains. I never thought I would go to places like Croatia or Pompeii, and I saw works of art that I thought I would only experience through a text book. 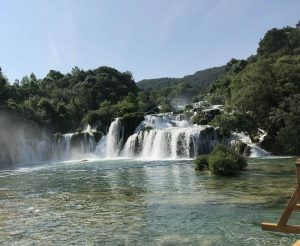 Studying abroad proved to me that I can go, see, and experience anything that I want to, traveling does not have to be a scary or worrisome experience! This was my last night in Florence with my best friends, I am so thankful I met them through SAI! 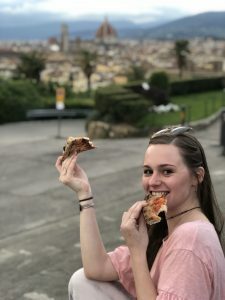 Sara was a summer 2018 SAI Florence student from the University of Georgia.